Scroll down to see the top not-for-profit colleges offering teaching degrees online. The Master of Arts in Teaching (MAT) from the USC Rossier School of Education prepares aspiring teachers for diverse and high-needs educational settings and can be completed in less than 18 months. GRE scores not required. Fordham University's online Master of Science in Teaching program prepares students for NY state initial teaching licensure in grades 1 to 6. Complete in two years–bachelor's degree required to apply. The Bachelor of Science in Career and Technical Education program at Appalachian State University is a degree completion program that can be pursued online. The following concentration areas are available: business, finance, and information technology education, business, marketing, and entrepreneurship education, technology, engineering, and design education, and trade and industry education. A concentration in family and consumer sciences education will soon be available online as well. Students who complete the program are qualified to teach at the middle and high school levels in their licensure (concentration) area. Up to 73 transfer credit hours are allowed, with the remaining 55-60 credit hours to be completed at ASU. Students are required to fulfill 12 credit hours of student teaching at a North Carolina school. Arkansas State University's online division, called A-State Online, offers graduate-level programs for educators, including options for a Master of Science in Education and Education Specialist. Seven MSE degrees are available online, including curriculum and instruction, early childhood education, and reading. Students interested in special education can earn an online MSE in gifted and talented education or in K-12 special ed instructional specialist. Educational leadership degrees are offered at the MSE and Ed.S. level. Coursework for some online degrees can be completed in as little as 12 months. Online classes are delivered in seven-week terms, with two terms per semester. Students can generally enter at the start of any term. Arkansas Tech University offers a Master of Arts (MA) in Teaching English to Speakers of Other Languages (TESOL) degree that can be completed online. Students admitted to the program must take four courses which are required by the Arkansas Department of Education for an ESL endorsement to an Arkansas Teaching License. These courses are: ESL Assessment, Teaching English as a Second Language, Teaching People of Other Cultures, and Second Language Acquisition. Students who are not licensed practicing teachers will be required to complete the MA TESOL exam in order to graduate from the program. The Center for Leadership and Learning offers two graduate degree programs online: Master of Education (M.Ed.) in Educational Leadership and Education Specialist (Ed.S.) in Educational Leadership. Auburn University offers several graduate-level education programs that can be completed both online and on campus. Master of Science (MS) and Master of Education (M.Ed.) degrees are available in the following areas: adult education, music education, and special education (early childhood/elementary and collaborative teacher programs). Students who are interested in the field of elementary and secondary education administration can explore the following online degree options: Education Specialist (Ed.S. ), Doctor of Philosophy (Ph.D.), and a graduate certificate. There are two additional Ed.S. degrees that are available online as well - Ed.S. in Adult Education and Ed.S. in Music Education. Auburn University offers graduate certificate programs in the following: adult education, adult education and English language teaching, transition specialist, and community music. Students seeking master's level training in education can choose from a variety of online options at Azusa Pacific University. The newest program is the Master of Arts in Art Education, which will launch in the summer of 2018. This program is primarily online but requires two week-long summer intensives on campus. Other online education master's programs include educational leadership, school librarianship, and educational technology. Azusa Pacific University also has shorter online certificate programs for educators who want to gain or add credentials, such as added authorization in special education, or a certificate in TEFL or TESOL. Ball State University offers nine education licensure programs that can be completed online. Master of Arts degrees are also available online in several fields, including applied behavioral analysis with an emphasis on autism, educational psychology, curriculum and educational technology, and educational administration and supervision with principal's license. The Master of Science in Quantitative Psychology program follows a blended delivery system. There are several graduate-level certificates available, some of which can be completed entirely online (early childhood program administration, middle level education, etc.) and others requiring some on-site attendance (community college leadership, middle school mathematics education, etc.). The university has two Doctor of Education (Ed.D.) degrees available online - Ed.D. in Adult, Higher, and Community Education and Ed.D. in Educational Administration and Supervision. The online Master of Arts in Art Education degree offered at Boston University is a 32-credit program that can be completed in 18-24 months. Students have the option of attending the Summer Studios in Boston where they receive hands-on, process-oriented instruction in a small class setting. The Venice Studio Arts Program is a summer Study Abroad opportunity open to both on-campus and online students at Boston University's center located near Campo Santa Margherita. The university's art programs are accredited by the National Association of Schools of Art & Design (NASAD). The following online degrees are available in music: Certificate of Advanced Graduate Study in Music Education (32 credits), Master of Music Education (32 credits), and Doctorate of Music Education (48 credits). Bowling Green State University has four Master of Education (M.Ed.) programs that are available 100 percent online. They are in the following areas: classroom technology, curriculum and teaching, learning design, and special education. Students accepted to the M.Ed. in Special Education degree can choose to concentrate in one of three areas: assistive technology, autism spectrum disorders, or secondary transition. An online M.Ed. in Reading program is currently being developed. The university offers endorsements in computer technology, reading, and transition-to-work fields. Certificate programs are available in assistive technology and in K-12 online teaching and learning. The university also offer two graduate certificates online - quality systems and autism spectrum disorders. All required courses for these programs follow 8-week delivery formats. Canisius University offers online Master of Science degrees in the following fields: educational leadership and supervision, education technologies and emerging media, literacy education, physical education, and TESOL (Teaching English to Speakers of Other Languages). Students admitted to the MS in Educational Leadership and Supervision program have the option of adding a content concentration for their elective courses, such as athletics administration or instructional leadership. The MS in Literacy Education program requires two weeks of residency during the summer term to comply with the practicum requirements of the degree. This may be completed in the student's geographical area. Canisius University also offers online advanced certificate programs (in TESOL and school district leader, for example) for students who already hold a master's degree. The Master of Arts in Education degree at Central Michigan University is TEAC-accredited (Teacher Education Accreditation Council). The online program offers concentrations in curriculum and instruction and in training and development. Students who choose the curriculum and instruction concentration can further specialize in one of two fields - instruction or reading. All students (regardless of their preferred area of specialization) must take the following courses: Strategies and Techniques for Teaching, Current Educational Issues, and Theory and Practice of Instruction. The training and development concentration is designed for students who want advanced training in the field of adult education. The 30-credit program includes coursework in the methods and techniques of training and development, administration within diverse populations, and planning for instruction in non-traditional settings. Concordia University in Chicago offers graduate-level programs in education that can be pursued online. Master of Arts degrees are currently offered in several fields such as curriculum and instruction, educational administration, higher education leadership, and education technology. A Master of Science degree in instructional design and technology is also available online. Students accepted to this 30-credit program enroll in classes in systematic and technological innovation, human-computer interaction and multi-media design, and instructional strategies for learning technologies. Concordia University also offers an online Master of Education (M.Ed.) in Teaching and Learning program. Doctor of Education and Doctor of Philosophy degrees are available in a number of fields including early childhood education, reading, language, and literacy, teacher leader, and community college leadership. Concordia University in St. Paul offers Associate of Arts in Early Childhood Education degrees (60 credit hours) and Bachelor of Arts in Child Development degree completion programs (42 credit hours) that can be pursued entirely online. Master of Arts degrees are available in curriculum and instruction, differentiated instruction, and special education. The Master of Arts in Education degree offers the following areas of emphasis: early childhood education, educational leadership, and educational technology. Each emphasis area is comprised of 30 credit hours. Concordia also offers an online Master of Arts in Teaching (MAT) program with K-6 licensure for educators seeking their initial teaching license in Minnesota. The MAT degree consists of 42 credits hours. All online education courses follow seven-week delivery formats. The online Bachelor of Science in Education degree offered at Drexel University is a part-time program that prepares students with transferable college credits for the PK-4 elementary teacher certification. Up to 90 credits from an accredited college or university may be applied towards the liberal arts or general education requirements of the Bachelor of Science degree. Drexel currently offers 13 online Master of Science programs in various fields such as global and international education, learning technologies, adult education and organizational development, and mathematics learning and teaching. Graduate certificates are available online in 14 areas, including instructional design, educational policy, student development and affairs, and autism spectrum disorders. A Doctor of Education in Educational Leadership and Management is also available online. East Carolina University offers various Master of Arts in Education (MAEd) degrees that can be completed online. Students can choose from 13 MAEd areas of study, including family and consumer sciences education, middle grades education, special education, reading education, instruction technology education, and science education. Applicants must already hold a valid North Carolina teaching license to be considered for admission. Graduate certificates are available in the following fields: elementary mathematics education, computer based instruction, and TESOL (Teaching English to Speakers of Other Languages). The university also offers add-on licensure programs for licensed North Carolina teachers who want to add another subject area expertise. There are three add-on licensure fields currently offered online - teacher education, birth through kindergarten, and computer education. Eastern Kentucky University currently offers online Master of Arts in Education degrees in the following areas: elementary education, school media librarian, gifted education, middle grades education, and literacy P-12. The Master of Arts in Teaching degree has concentrations in elementary, middle grades, secondary, and interdisciplinary early childhood education. The program is designed for students with a bachelor's degree in a non-teaching field and who want to pursue a teaching career. Endorsement preparation programs are offered in the following: supervisor of instruction, gifted education, superintendent of schools, director of pupil personnel, and English as a second language P-12. There are special education certificates available in learning and behavior disorders, interdisciplinary early childhood education, deaf and hard of hearing, and moderate and severe disabilities. There are two online Master of Arts (MA) degrees in the field of education that Eastern Michigan University offers online: MA in Educational Leadership - K-12 Administration and MA in Educational Media and Technology. The MA in Educational Leadership - K-12 Administration degree is approved for the building level principal license in Michigan and has reciprocity across the country. The MA in Educational Media and Technology program is designed for students who are interested in facilitating student learning through the effective use of technology in a variety of educational environments. Graduate certificates in educational media and technology (20 credits), educational assessment (12 credits), and online teaching (12 credits) are also available online. A 23-credit Post-Master's K-12 Basic Administration Certificate is offered online as well. Emporia State University is the site of the National Teachers Hall of Fame and the Fallen Educators Memorial, so obviously teacher education is important to the institution. It's no surprise then, that the university extends its teacher training programs to the internet. Several master's programs are available online, including four concentrations in curriculum and instruction. Other online programs are a Master of Science in Educational Administration and one in Early Childhood/Elementary Education/Special Education. ESU does not have any undergraduate teacher programs online. The ESU Teacher College has received numerous awards for excellence and currently has more than 1,300 graduate students enrolled. The Master of Science in Curriculum and Instruction degree at Florida International University is offered entirely online and can be completed in just 12 months. Students accepted to the program specialize in curriculum development and must complete an Action Research Project in order to earn the degree. The university also offers an online Master of Science in Special Education program that leads to an autism endorsement. Students focus their studies on classroom-based research and are trained to work with culturally and linguistically diverse student populations with special needs. Each program consists of 36 credits and offered in six accelerated eight-week terms. A newly re-designed Master of Science in Music Education program is now available in an online seven-week format. Fort Hays State University has been listed among the Best Online Graduate Education Programs by U.S. News and World Report multiple times this decade. The university's Department of Advanced Education Programs offers a wide range of online programs, including master's degrees, education specialist degrees, and teaching endorsements. In addition to being online, some of the programs have added flexibility, such as a choice of four-, eight- or 16-week classes in the building principal master's program. Career changers who have a background in certain content areas may be able to enroll in FHSU's Transition to Teaching program, which is offered online. Students in this program can work as a teacher on a restricted license while completing the program. Framingham State University offers an online Master of Education (M.Ed.) degree with the following areas of concentration: curriculum and instructional technology, educational technology, and nutrition education. The M.Ed. in Curriculum and Instructional Technology prepares students for the Massachusetts Initial License as an instructional technology teacher in all levels. Students admitted to the M.Ed. in Nutrition Education program can choose to specialize as a school nutritionist or as a nutrition education specialist. There is a hybrid M.Ed. in Science, Technology, Engineering, and Mathematics (STEM) program designed for teachers in Grades 1-6 that can be completed in two academic years and three summers. The STEM program follows a cohort model of education. A Graduate Certificate in Instructional Technology Proficiency program is also available online. Educators can earn master's degrees or graduate certificates in a wide range of specialties through Mason Online, George Mason University's online learning division. Online master's programs include Master of Education in Special Education, with or without an Applied Behavior Analysis emphasis, and an M.Ed. in Curriculum and Instruction with a concentration in blended and online learning in schools. Certificate programs mirror the online degrees to a great extent, and include assistive technology, autism spectrum disorder, and education leadership. Students may enter any of the programs in the fall, and some also allow admission in the spring. George Mason was listed as one of the Top 100 Best Values in Public Colleges in 2017 by Kiplinger's magazine. The Master of Arts in Teaching degree with a concentration in middle grades education is offered entirely online at Georgia College. The program provides initial teacher preparation for students who graduated with bachelor degrees that did not include professional training in education. The 36-credit program must be completed within six years of a student's initial matriculation. Georgia College also offers a Master of Education program with a concentration in secondary education. Students can choose from several areas of specialization including secondary Biology, English, French, History, Mathematics, Political Science, and Broad Field Science. Fully online Master of Education degrees are also available in educational leadership, educational technology, and library media. Specialist in Education degrees are available in educational leadership and in secondary education. The School of Education at Hamline University offers fully online Master of Arts degrees in ESL (English as a Second Language), literacy education, and TESOL (Teaching English to Speakers of Other Languages). A Master of Arts in Education (M.Ed.) degree is also available online, as well as an M.Ed. program with a concentration in natural science and environmental education. At the current time, there are four licensure programs offered: Autism Spectrum Disorders (B-21), Bilingual/Bicultural Education (K-12), English as a Second Language (K-12), and K-12 Reading. The autism and bilingual licenses require the completion of a practicum program. Certificates are available in adult ESL, bullying prevention, college admission counseling, autism spectrum disorders, environmental education, and advanced TEFL (Teaching English as a Foreign Language). Harvard University offers a master's in mathematics for teaching that can be earned partially online. The program is through the Harvard Extension College, which has an unusual admission process. Instead of applying first, students take two stipulated courses to gain admission. After proving they can handle the work, student apply for admission to the program, which accepts students in the spring, summer, or fall. Once in the program, students take another 10 classes, with at least four of those completed on campus. Harvard offers three-week summer sessions on campus. This program gives students the choice of a thesis or capstone track. The degree granted is a Master of Liberal Arts in Extension Studies: Mathematics for Teaching. Hofstra University offers a fully online 36-credit Master of Science in Education (MSEd) degree with a concentration in leadership in higher education settings. The curriculum includes coursework in governance, legal and ethical issues, student affairs leadership, and planning, assessment, and accreditation in higher education. There is also an online 31-credit MSEd in Special Education - International Perspectives program available with a focus on inclusive education and the nature and needs of specific disabilities. An Advanced Certificate in Gifted Education can be completed entirely online. The following certificate programs follow a hybrid delivery format: childhood special education (Grades 1-6 and Grades 7-12), early childhood special education (Birth - Grade 2), special education assessment and diagnosis, and teaching students with severe or multiple disabilities. Indiana University Bloomington offers online Master of Science in Education (M.S.Ed.) degrees in educational leadership, instructional systems technology, special education, and literacy, culture, and language education. A Master of Science in Adult Education degree is also available online. The graduate certificates offered at the university are stand-alone programs consisting of 12 to 15 credit hours each. However, certificate credits can also be applied towards a master's program after completion. Indiana University Bloomington offers several graduate certificates in various areas including education law, EFL/ESL teacher training, higher education and student affairs, and online instruction and assessment. At the current time, there are two Doctor of Education (Ed.D.) degrees offered online - Ed.D. in Instructional Systems Technology and Ed.D. in Literacy, Culture, and Language Education. The Bagwell College of Education at Kennesaw State University offers three online graduate-level programs for licensed teachers: Master of Education (M.Ed.) in Early Childhood Education, Educational Specialist (Ed.S.) in Curriculum and Instruction, and Doctor of Education (Ed.D.) in Instructional Technology. Certified teachers in elementary education can earn the M.Ed. degree in just 13 months. The Ed.S. program is for educators with a T-5 certificate or higher. The Ed.D. program is based on the International Society for Technology in Education (ISTE) Standards for Technology Directors and the Consortium of School Networking (CoSN) Framework of Essential Skills for K-12 Chief Technology Officer. Certificate and endorsement programs are also offered online in areas such as curriculum and instruction, educational leadership, and online teaching. Kent State University currently offers four online graduate-level degrees in the field of education: Master of Arts in Art Education, Master of Education in Instructional Technology, Master of Education in Evaluation and Measurement, and Master of Music in Music Education. In addition, there are a number of certificate programs that can also be pursued online, including a 21-credit Autism Spectrum Disorder Certificate that can be completed in one academic year. The other certificates are in the following areas: college teaching (15 credits), community college leadership (15 credits), early intervention (30 credits), Ohio superintendent licensure (18 credits), and online learning and teaching (15 credits). A Transition Specialist Endorsement is also offered online. This program requires the completion of at least 15 credits. Educators can earn an advanced degree or gain additional certifications through LU Online, the online arm of Lamar University. Programs are available at the master's and doctorate level. At the master's level, options include teacher leadership, educational administration, and special education. Students interested in combining technology and education can earn a master's in digital learning and leading or in educational technology leadership. The Ed.D. program is in educational leadership. Educators can also gain certification for principal or superintendent in Texas. Some of the programs use a five-week class format. Lamar's online graduate education programs were listed in the top 25 percent in the 2015 U.S. News rankings. Lesley University offers several Master of Education (M.Ed.) degrees that can be pursued entirely online. At the current time, M.Ed. degrees are available in the following fields: mathematics education, science in education, curriculum and instruction - elementary education generalist, language and literacy, and educational technology. The M.Ed. in Science in Education program is approved by the Massachusetts Department of Elementary and Secondary Education for Professional Teaching Licensure in Elementary (1-6) or Middle School (5-8) General Science. There is also an M.Ed. in Individually Designed Program for Educators that allows students to craft a flexible course of study that supports their academic and professional goals. The university offers 10 graduate certificate programs in areas such as emerging technologies, TESOL, and autism spectrum disorder. Mary Grove College offers an online Master of Arts in Teaching degree with the following focus areas: curriculum instruction and assessment, K-12; elementary reading and literacy, K-6; elementary mathematics, K-5; middle level mathematics, Grades 6-8; and effective teaching for the 21st century. All students are required to enroll in the following courses, no matter what focus area they select: Teacher as Leader, Meeting the Needs of All Students, Instructional Design, Affective Assessment, Teacher as Researcher, and Evidence-Based Interventions. There is a Master of Arts in Educational Leadership degree that can be pursued online as well. Students who complete the program are eligible to apply for the School Administrator Certification K-12. A Master of Education in Educational Technology degree is also offered online. Mercy College offers a range of education degrees, most at the master's level, through online class work. For example, students can earn a master's degree and initial or professional certification in teaching subjects such as chemistry, English, or math. Mercy also has combined bachelor's/master's programs that allow students to earn two degrees and receive teacher certification in an accelerated period. Options include psychology and early childhood or childhood education, and behavioral science and childhood education. The Master of Science in Educational Studies is a master's in education that does not include certification, which is not needed for some private schools. TESOL credentials can be earned through a Master of Science or advanced certificate program. The College of Education, Health and Society at Miami University offers two fully online degrees in education - Master of Arts (M.A.) in Instructional Design and Technology and Master of Education (M.Ed.) in Educational Technology. Both are comprised of 30 credits and can be completed in 12 to 14 months. An M.Ed. in Special Education degree is available in a hybrid format. This program is designed for students with a valid teaching license in any field who want to add an Ohio K-12 Mild-Moderate Intervention Specialist teaching license or a master's degree in special education to their credentials. A Graduate Certificate in Instructional Design and Educational Technology and an Educational Technology Coaching Endorsement can be completed entirely online as well. Teachers seeking to advance their career or gain additional certifications can achieve those goals through graduate-level programs offered online by Missouri State University. Master's degrees are offered in elementary education, literacy, educational technology, and special education. With the elementary education program, students can tailor the program to specialize in areas such as ESL, specific middle school content areas, or reading. Students who take two classes per semester can finish the degree in two years, but timing is flexible. Educators seeking a shorter-term alternative can earn an online graduate certificate in several areas of specialization, including gifted and talented, deaf and hard of hearing, or educational technology. Students who want to qualify for a career in teaching or expand their qualifications may be able to enter an online program offered by National University. At the bachelor's level, some of the programs are available only to residents of Nevada or California, but the Bachelor of Arts in Early Childhood Education is open to students located anywhere. Before entering the program, students should check their state's specific requirements for teacher licensing. National University also has graduate level programs including certificates in teacher leadership and educational technology. It also offers a Master of Arts in Language Teaching and Learning. Again, some graduate programs are only for California residents. Northern Arizona University offers several online degrees in the field of education both on the graduate and undergraduate levels. There are a number of online certificate programs as well. Students pursuing the Bachelor of Science in Education - Career and Technology program can transfer a maximum of 90 units from an accredited associate degree program. The remaining 30 units must be comprised of upper division courses at NAU. Master of Education (MED) degrees are available in the following areas: early childhood education, educational leadership, educational technology, elementary education, ESL and bilingual education, special education, and secondary education. Graduate certificates are offered in assistive technology, career and technical education, community college teaching and learning, positive behavior support, and teaching introductory community college mathematics. Nova Southeastern University offers several online degrees in education that are accredited by the Electronic Campus Program of the Southern Regional Education Board (SREB). Courses are available both synchronously and asynchronously. At the current time, there are 27 Master of Science in Education (MSE) programs offered online in diverse fields. MSE programs are available in elementary education with ESOL endorsement, urban studies education, charter school leadership, early literacy education, educational technology, Spanish language education with bilingual endorsement, and several others. The university also offers 14 Certified Education Specialist programs (curriculum and teaching, gifted child education, technology management and administration, educational leadership, etc.). A Graduate Certificate in Education Law is offered online in conjunction with the Shepard Broad College of Law. Old Dominion University has programs to prepare teachers and to help licensed teachers advance their careers through online coursework. Students seeking licensure can earn initial Virginia licensure in elementary education through a Master of Science in Education or a post-baccalaureate endorsement. ODU also has an online preparatory program for elementary teachers, the Bachelor of Science in Interdisciplinary Studies: Teacher Preparation, that allows students to transition seamlessly to a licensure program. Those interested in educational leadership can get an MS in Education or an Education Specialist degree. Licensed elementary teachers can update their expertise with an online master's in education. The Master of Arts in Education in Curriculum and Instruction degree offered at Olivet Nazarene University is a 33-credit program that can be pursued entirely online. The program follows a cohort model of instruction and can be completed in 22 months. Students enroll in classes that cover topics such as applied learning theory, principles and practice in education research, the exceptional learner, and critical issues in education. The university also offers a Master of Arts in Education - Reading Specialist degree (32 credits) that can be completed in 18 months, as well as a reading specialist endorsement (24 credits) that can be completed in one year. There is a 24-credit Teacher Leader Endorsement program available that students typically complete in 16 months. The online Associate of Arts in Teaching (A.A.T.) degree offered at Ozarks Technical Community College is a 65-credit program designed for students who plan to transfer to four-year universities that offer teacher education and PK-12 certification programs. In addition to completing the General Education coursework, students must also enroll in 13 hours of teacher education professional courses and 9 hours of electives. The required courses for the A.A.T. degree are the following: Introduction to Teacher Education, Foundations of Education, Technology for Teachers, Educational Psychology, and Teaching Professions with Field Experiences. Students should select General Education courses that fulfill the requirements of the bachelor's program to which they plan to transfer, as well as the level and type of Teacher Certification they seek. The online Master of Education (M.Ed.) in Curriculum and Instruction offered at Pennsylvania State University has five emphasis areas - children's literature, STEM education, elementary education, curriculum and supervision, and theory and practice in English, Social Studies, and world languages. The M.Ed. in Educational Leadership program offers a School Leader emphasis that meets the requirements for school principal certification in Pennsylvania. Students accepted to the M.Ed. in Higher Education program can choose to focus in one of three areas: administration, student engagement, and institutional research. The M.Ed. in Special Education program has the following areas of emphasis: academic and behavioral supports, applied behavior analysis, and autism. Online post-baccalaureate certificates are offered in adult basic education, distance education, and educational technology integration. The online Master of Science in Education degree offered at Peru State College is a cohort program that accepts new students each summer in June. The degree is made up of 36 credits and can be earned in just 19 months, or five academic semesters. Summer courses are each eight weeks long, while fall and spring courses are each four weeks in length. Students can transfer a maximum of six graduate-level credits from an accredited institution. The curriculum includes coursework in traditional and emerging topics in education. Students have the opportunity to study and develop an in-depth understanding of areas such as cognition and learning, curriculum development, multi-media authoring, technology and mediated instruction, and study design and data collection. Rowan University offers online Master of Arts degrees in three areas: school administration, special education, and reading education. The MA programs in special education and in school administration each offer tracks in graduate endorsement, autism spectrum disorders, and learning disabilities. The MA in Reading Education degree is accredited by the National Council for Accreditation in Teachers Education NCATE) and the International Reading Association. Graduate certificates are available in the following: English as a second language, learning disabilities, special education, Reading, teacher of students with disabilities, and teaching and learning. A Master of Education in Teacher Leadership program is available, in addition to a Doctor of Education in Educational Leadership degree with tracks in community college leadership, higher education, nurse educator, and P-12. Students whose goal is to teach can begin at South Texas College, which has online programs leading to an Associate of Arts in Teaching with a track in elementary, middle school, or high school education. While earning the associate degree, students complete 42 credits in general studies requirements and 18 credits in the major. They'll also take part in field observations at local public schools. Students can then transfer to a four-year school such as the University of Texas to earn a teaching degree. The two-year degree from South Texas also meets requirements for paraprofessionals. Some classes count for substitute teacher and teacher assistant continuing education certificates. The School of Education at St. John's University offers a Master of Science in Education (MSEd) in Teaching Children with Disabilities in Childhood Education (1-6) degree that can be completed online. Students who complete the 33-credit program are qualified for New York State initial certification as a teacher for students with disabilities (Grades 1-6). The MSEd in School Building Leadership program is one of the first completely online degrees in the field that is recognized by New York State. Students who complete the program, including a subject matter concentration, are qualified to apply for permanent teaching certification as well as building-level administrative certification. Several advanced certificate programs are currently offered online (gifted education, school district leadership, bilingual education extension, etc.). The online Master of Science in Library and Information Science degree at Syracuse University offers a specialization in school media. The program is accredited by the American Library Association Committee on Accreditation. Classes have synchronous and asynchronous components and delivered in four 12-week quarters. Online students must attend a weekend immersion experience on campus. The 37-credit curriculum includes courses that cover topics such as organization and access of information resources, literacy through school libraries, and information technologies in educational organizations. The completion of a supervised practicum experience in a pre-approved school-based library is a requirement for graduation. The program fulfills the education requirements for certification as a school library media specialist in a New York State elementary or secondary school. The Teachers College at Columbia University offers a Master of Arts in Computing in Education degree that can be completed online. Students must complete at least 32 points in order to graduate. Credits earned from a non-Teachers College program are not eligible for transfer towards the degree. The curriculum focuses on coursework in cognitive and social issues and in technology and educational practice and design. Students enroll in classes that cover topics such as technology and school change, managing educational technology resources, hypermedia and education, and computers and the uses of information in education. The completion of an integrative MA project is a requirement for graduation. Students can complete the MA project on their own or as part of a group. 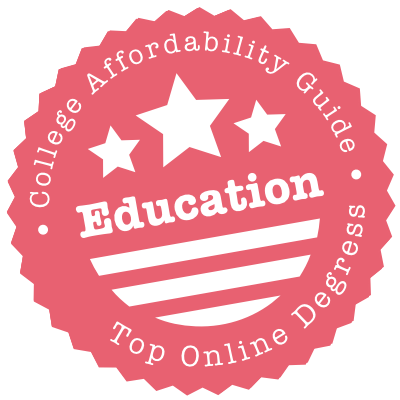 The University of Texas at Arlington ranked just outside the Top 50 for Best Online Graduate Education Programs, coming in No. 56 in the 2018 U.S. News rankings. UTA has four graduate education degrees available online, and all are presented in an accelerated format. The Master of Education in Educational Leadership & Policy Studies is a 30-credit program that can be completed in 15 months. The Master of Education in Curriculum and Instruction has three concentrations (literacy studies, math education, or science education), and candidates can complete the coursework in 18 months. Educators who want a superintendent certificate can complete the 15 credits required in nine months. Online education programs have six start dates each year. The University of Akron offers a Master of Arts in Educational Foundations degree that can be completed online. The program consists of 30 credits and offers an emphasis in instructional technology as well as in assessment, evaluation, and data literacy. Students who opt for the instructional technology program study a wide range of established and emerging technologies, instructional design principles, and the application of technology in various educational settings. The MA in Assessment, Evaluation, and Data Literacy program focuses on school-based assessment and evaluation and equips students with the knowledge and skills necessary to make informed data-driven decisions in education. At the current time, online certificates are available in the following areas: assessment and evaluation, e-Learning, and literacy specialist. The College of Education and Human Performance at the University of Central Florida (UCF) offers a Master of Education degree in exceptional student education that can be completed online. The program prepares students to work with K-12 students with disabilities. Applicants must have a valid Florida Professional Teaching Certificate in Exceptional Education or fulfilled all the requirements for certification. The program consists of 33 credits and allows students to choose a thesis or non-thesis option. At the current time, UCF offers online 15-credit graduate certificate programs in the following areas: gifted education, initial teacher professional preparation, and educational technology. A 12-credit Graduate Certificate in Pre-Kindergarten Disabilities Endorsement and an 18-credit Graduate Certification in Special Education are available online as well. The University of Central Missouri offers an online Bachelor of Science in Occupational Education program designed for mid-career professionals who want to pursue a teaching career in their specialty area. Graduates can apply for a Career Education teacher certification with the Missouri Department of Elementary and Secondary Education. The certification qualifies them to teach in a variety of educational settings, including community colleges and business training programs. The following online degrees are available on the graduate level: Master of Science (MS) in Career and Technical Education Leadership, MS in Educational Technology, Master of Science in Education (MSE) in Curriculum and Instruction, MSE in Education in Elementary Education, and a Master of Arts in Teaching with a secondary and middle school concentration. The College of Education, Criminal Justice, and Human Services at the University of Cincinnati currently offers two online undergraduate degrees in education - Associate of Applied Science in Early Childhood Care and Education and Bachelor of Science in Childhood Education. On the graduate level, Master of Education (M.Ed.) programs are available online in the following fields: curriculum and instruction, educational leadership, literacy and second language studies, and special education. The M.Ed. in Curriculum and Instruction has three tracks of study: gifted, creative, and talented, STEM, and teacher leader. The university also offers graduate certificate programs in TESOL and in K-12 reading specialist. The certificates can be applied towards a specialization in the M.Ed. in Literacy and Second Language Studies program. Mizzou's College of Education places over two dozen degrees and certificates online, with only a handful requiring campus visits. The starter degree is the Bachelor of Education Studies, which gives a broad overview of how to teach people via platforms like workforce development programs or human resource trainings. It doesn't lead to certification like the MEd programs, which come in a variety of classroom subjects, plus specialty areas like Autism Education and Positive Coaching. Collectively, U.S. News & World Report ranked them #61 on its 2017 list of best online graduate education programs. Those who already have a master's can consider one of Mizzou Online's six Education Specialist degrees, its PhD in Art Education, or the EdD in Educational Leadership. The University of Southern Florida (USF) offers several online degrees in education on the graduate level. Master of Arts (MA) programs are available in the following areas: adult education, autism spectrum disorder and severe intellectual disabilities, career and technical education, gifted education, physical education, reading K-12, and special education. The university offers two Master of Education (M.Ed.) degrees online - M.Ed. in Instructional Technology and M.Ed. in Secondary Education with an emphasis in TESOL (Teaching English to Speakers of Other Languages). An Education Specialist (Ed.S.) degree in instructional technology is available online as well. There is currently only one doctorate program offered online at USF - Doctor of Philosophy in Curriculum and Instruction with a concentration in career and workforce education. The University of the Cumberlands offers a Bachelor of Science in Elementary Education degree that can be completed online. Students can transfer credits from Educator Preparation programs that the university has in place within the Kentucky Community College system. The curriculum includes coursework in effective teaching practices, classroom management and behavior, and the psychology of learning and exceptionality. The university also offers a Master of Education degree that provides additional certification in literacy, school counseling, and teacher as leader. School administration certification programs are available and can be completed in three eight-week terms (except for the School Principal certificate). The following administrative certificates are offered: Director of Pupil Personnel, Director of Special Education, School Superintendent, Supervisor of Instruction, and Teacher Leader Endorsement. Name an education degree or certification and chances are University of West Alabama has it online. A trio of Bachelor of Science degrees covers special education, elementary education and early childhood development, while a dozen teaching certification programs help put baccalaureate-holders into subject-specific positions in schools and classrooms. Those certifications pair well with any of UWA Online's 11 theory-heavy MEd degrees, such as Library Media and School Counseling. At the post-graduate level, nine Education Specialist degrees represent every aspect of the discipline from Early Childhood Education to Instructional Leadership - and can be earned in just one year. The Bachelor of Science in Early Childhood Education (ECE) degree offered at the University of Wisconsin Whitewater is an online hybrid program designed for students who already have an Associate of Applied Science degree in ECE. Graduates qualify for two Wisconsin State Department of Public Instruction licenses: Early Childhood Education and Special Education, Birth - Age 8. A Master of Science in Special Education program with an emphasis in professional development is also offered online. The university offers a fully online certificate in Applied Behavior Analysis that meets the coursework requirements for the Board Certified Behavior Analyst Examination. Autism Specialist Certificates and Transition Specialist Certificates are also available. The Alternative Education Programs Licensure is designed for educators working in alternative education settings. The Teachers College at Western Governors University offers several online degree options that lead to initial teacher certification. At the current time, there are eight Bachelor of Arts degrees, four post-baccalaureate teacher preparation programs, and five Master of Arts in Teaching degrees available, which are all accredited by the National Council for the Accreditation of Teacher Education (NCATE). Students can earn credits for past educational and professional experiences that may allow them to earn their degree in a shorter amount of time. There are also several advanced-level programs available for students who already have initial teacher certification and who want to specialize in a particular field (science education, instructional design, English language learning, etc.) or receive preparation for further studies. Western Michigan University offers online Master of Arts degrees in the following areas: art education, career and technical education, coaching sport performance, educational technology, physical education, and science education. The MA in Career and Technical Education has two areas of specialization. The Troops-to-Teachers program is designed exclusively for U.S. military personnel with an undergraduate degree and work experience in a teachable area, while the Post-Baccalaureate Teaching Certification is designed for non-service professionals with a bachelor's degree in a teachable area. Graduates meet the academic requirements for Initial Teacher Certification in Michigan. The MA in Physical Education degree offers concentrations in pedagogy and in special or adapted physical education. A Graduate Certificate in Educational Technology (comprised of 18-21 credits) is also available online. Wilkes University offers several online and hybrid graduate-level programs in the field of education. There are currently 17 Master of Science degrees available in areas such as early childhood literacy, instructional media, international teaching and learning, classroom technology, and school business leadership. In addition, there are certificate programs offered in the following fields of specialization: Grades 4-8, special education, ESL program, instructional technology, reading, and K-12 principal certification. Wilkes University offers a Doctor of Education (Ed.D.) in Educational Leadership degree with three areas of specialization: curriculum and instruction, educational technology, and educational leadership studies. Twelve-credit endorsement programs are available in discovery education (EDGE), autism, STEM, and teacher leadership and instructional coaching. A 30-credit Letter of Endorsement in Online Instruction is also offered. In addition to the Doctor of Education program with a Higher Education Leadership & Innovation specialization, Wilmington University places 4 graduate degrees and 5 graduate certificates online. Most of the certificates are specific to special education, while the degrees span everything from technology to technical education. At the undergraduate level, students can pursue an age-specific specialization on their way to a BS in Education Studies, a degree also available at the master's level. These degrees do not prepare students for state licensure; instead, they are designed for people seeking other careers in youth-oriented settings, such as nonprofit organizations. Because affordable bachelor’s degrees in education require a practical component (e.g. supervised teaching) for teacher licensure, 100% online degrees are rare. However, you may be able to find hybrid programs that combine online courses in theory with internships in your local area. Just make sure that they’re approved by the state. Choices improve at the graduate level. 100% online master’s programs and add-on certificates are much more common for those who are already certified to teach and have some practical experience under their belt.